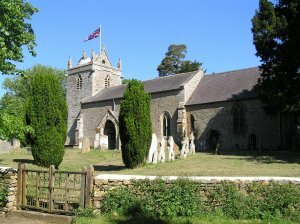 The Church is one of six parish churches in the Culworth Benefice. Unfortunately it is not possible to open the church every day. If you are visiting the church and would like to ensure it will be open, please telephone Maurice Cole on the number below. A Holy Communion service is normally held at Thorpe on the 3rd Sunday every month at 11.00am in addition to the festival services. A 10.00am benefice Holy Communion service rotates around the six parishes on the 1st Sunday every month. (See the Home page for current services in the parish.) Even if you have not been confirmed you will be most welcome at these services. The church building dates back to at least the early 14th century and it has Grade I listed building status. Features include a saddle-back tower roof, an impressive early 17th century monument to the Kirton family, a 14th century wall painting and attractive 19th century scholastic stained glass windows. There is a splendid ancient yew tree in the churchyard being well over 1,000 years old. There is little doubt that the formative years of the puritan pioneer Rev'd John Mayo were in Thorpe Mandeville. Rev'd Mayo became the first pastor of the Second Church in Boston (The Old North Church) in 1655 and he was appointed to the Board of Overseers of Harvard College. Villagers have maintained our church for nearly 1000 years and hopefully we will do the same for future generations but it is currently a struggle. The upkeep of the church is entrusted to a team of parishioners constituted as the Parochial Church Council (PCC). Responsibilities include the running and maintenance of the building as well as funding the clergy. Finance is a main concern of our PCC. All parishes are required to fund the upkeep of their church buildings and the provision of clergy, the latter being assessed within a Parish Share assessment. We receive no financial support from the Church of England. Our church is therefore dependent on donations from parishioners to keep the church open. We struggle to find sufficient funds, not meeting the requested Parish Share in recent years, being £1,363 short in 2018. Basic running costs in 2018 exceeded £7,500 including the Parish Share. If you would like to contribute to the upkeep of our church, either by a single payment or annually, the PCC would be most appreciative. Please contact the rector or churchwardens. The PCC has charitable status enabling tax refunds to be made under the Gift Aid scheme. If your focus is on the maintenance of the church building in its beautiful setting, separate funds are held for both the the fabric of the church and churchyard maintenance. There have been thefts from local churches. An attempted theft of lead at our church left damage to the roof. If you see questionable activity at the church please check with a churchwarden as soon as possible and record the vehicle registration. The PCC places great importance on Safeguarding matters and a copy of the PCC's Safeguarding Policy is on display in the church. The information on this page has been provided by Thorpe Mandeville Parochial Church Council.